This is a highly credible account of some very strange goings-on at an 18th Century farmhouse set in the Litchfield Hills deep in the Connecticut countryside. The author has already written a book about another local haunting, that in 'Lindley Street', and this time shines a torch into the murky darkness of decades of paranormal events affecting several generations of an otherwise perfectly normal rural family. The action is specific to their family home. When family members travel or live elsewhere they experience what it feels like to be 'clear' of the voices and footfalls which haunt them regularly at home. But when they return to the house, the events continue, in an haphazard and unpredictable way. Previous generations had worried about letting it be known locally that their house was haunted, presumably because of the effect that that knowledge might have upon the property value of the estate (and also, I suspect, the family's local reputation). 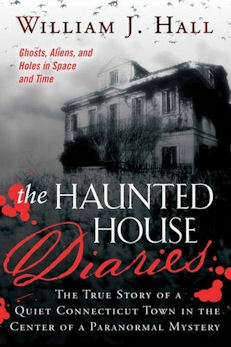 However, Donna Fillie decided to break the silence, and provided researchers with her diaries of the events, all faithfully recorded over several decades. Her clear and detailed accounts are supported by further descriptions supplied by her now grown daughter, Michelle, who experienced some of the same events as her mother from a young age. These are just two of the generations affected, and the weird events at the house continue, raising speculation that it stands at some kind of multi-dimensional gateway. The nature of the events vary greatly. Voices of unknown provenance play a leading role, but there are more dramatic events too - sightings of ghosts, for want of a better word, poltergeist activity, bent cutlery, unexplained noises from footsteps to loud bangs, and often the sensation of being touched; although usually in a kind, familial way rather than of a creepy, threatening nature. The family don't feel that the source of these events is evil, or even particularly threatening. Indeed, the activity appears random, purposeless and possibly, in the case of various apports (coins, lost jewellery and the like), benign. I have my own hypothesis about some of what's going on here, based upon discussions about the basement (pp36, pp39-40, pp139-140: ("...our cellar has been smelling odd for some reason.")). I suspect that this old house is contaminated with toxic moulds, which release spores which lead to hallucinations. There are enough clues in the diaries to point a suspicious finger in the direction of the basement area. Recent published research backs up such a possibility (1). While such environmental causes might explain the audible and visual hallucinations, they fall short of dealing with the bent cutlery and moving objects (sometimes involving multiple witnesses). So, even if this was true (and it's not an idea even engaged with by the author or his fellow investigators, who seem utterly convinced that this is all paranormal/supernatural in origin) there's still some weird stuff going on here. Naturally enough, the family tries to find a pattern in the erratic weirdness taking place in the house. Sometimes it's frightening, sometimes annoying, always disconcerting. What's often surprising about ghost/spirit reports is how lacking in profundity they are - almost as if the shades are simply going through the motions of an everyday existence unseen; and that it certainly true here. It's little wonder that a multi-dimensional explanation is called for (a wonderful theory is provided on page 91), although one could equally argue that an hallucinatory explanation would dredge up similar mundane events from the sub-conscious with which to dress the 'haunted' milieu. Finding characteristics within the event which draw in memories of lost loved ones is also common, and entirely understandable. However, oftentimes, the entities themselves bear little resemblance to departed relatives, even taking on alien qualities, dipping the phenomena into an entirely different bracket of characterisation. Multiple sightings were rare, although not unheard of. But tangible physical and photographic evidence is rather lacking. We rely instead upon the accounts of Donna and her immediate family, as compelling as these are. Indeed, Donna's eloquence and matter-of-fact analysis of the issues at hand are not only commendable, but also rather better organised and assimilated than the author's own addenda and analyses. Donna's account of young Dale's uncharacteristically mature descriptions of his imaginary friend 'Ashwar' are particularly poignant, if not downright puzzling. For any paranormal researcher, it would be a privilege indeed to be granted the opportunity to investigate the events at this property, and in particular the down-to-Earth, compelling accounts provided by the witnesses/experiencers. William Hall and his colleagues did some hands-on research at the property, as well as the surrounding locale to establish any kinds of discernible patterns of unusual activity (of which there was, interestingly, quite a bit). However, I think the rest of the book falls rather short of producing the kind of analysis and context which would have done justice to the unexplained material in question. The book suffers from a localism issue: Personalities, places and events are brought up with little explanation. As an British reader, i could barely tell you what towns are in Connecticut, let alone be acquainted with the members of Hall's investigatory team, whom he seems little star-struck by. Too much is assumed, too little is questioned. I would have liked to have seen a floor plan of the house (whose ramshackle layout is hinted at, but was left to the reader to piece together in their mind). This was an important consideration when trying to find patterns in the accounts (and this is, after all, a mystery deserving of a solution, if at all possible). The allusion to a secret military establishment nearby is discussed in terms of local rumours, and sightings of unusual military activity, but no historical data is sought in the local records, nor any FOIA request submitted. Perhaps there is an underground base in the area, which might explain some of the ground-penetrating rumbles and bangs experienced by members of the household (as well as other local residents), but there is no supporting evidence to back up this kind of assertion. Of course, some good points are made by Hall et al, but these sections at the back of the book lack the structure and self-questioning attitude exhibited by Donna which itself serves the case so well. Nevertheless, I enjoyed learning about this case-study immensely, and commend the family on bringing this information out into the public domain, and Mr Hall for facilitating this. Subtitled "The True Story of a Quiet Connecticut Town in the Center of a Paranormal Mystery"